Wondering if Salomon Conquest GTX boots are for you? I get it…. 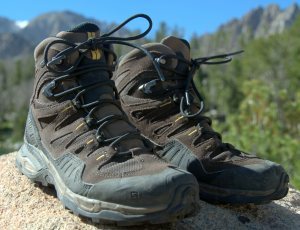 Finding a comfortable pair of hiking boots to stand up to the elements of nature with an affordable price tag is pretty tough. That’s one reason I’m writing this Salomon Conquest GTX Boots Review, to point out the cream of the crop before you start getting frustrated! I’m an avid hiker and really put my boots through hell; I’m tough on them because I hike hard. So if I like the boots and they are durable and cost-effective for me, there’s a pretty good chance they’re perfect for you. I work through the process of elimination and not hearsay. The first thing I do is research the boot, then I call in a few favors from expert hiking friends to get their opinion and narrow the options down, and then I buy the backpacking boots and test them out for myself. I’ve even got a handy-dandy notebook I use to journal my findings along the way. That’s a little nerdy, haha, but you’d be surprised how much your brain forgets after a grueling backpack trip! These Salomon Conquest GTX boots felt great on my feet when I was trekking through Yosemite carrying 40 pounds on my back; up steep hills and down into muddy ravines; both on and off trail. 18 miles later and the boots were still feeling good; but I can’t say that for the rest of my body! This Salomon Conquest GTX boot is mid-weight and a little more rigid than the competitor; exactly what I wanted. The reasons the boot is a little stronger: firm heel cup with plenty of cushion, an above-cut ankle, and better flex rigidity than other models. The midsole sports an impressive molded underfoot; which provides superb comfort. With the fit close through the heel through the midfoot for middle-volume feet, you get more confident comfort. The rubber toecap, slick suede uppers, and custom perimeter mudguard protects against the wear and tear beatings – you won’t ever see any major wear on the Salomon Conquest GTX boot, it’s designed that well. And you don’t have to worry about winding up with a sopped foot because the specialty Gore-Tex membrane ensures your feet stay dry. My inner black sheep made me test the boot in shallow waters and it came through with an A+. This Salomon Conquest GTX boot is designed with the breathability to keep feet from overheating, and the protective sealant to make sure water doesn’t get in and wreck your backpacking adventure. It’s an excellent design that gives you warmth and dryness in a comfortable sturdy boot! When I was writing up this Salomon Conquest GTX Boot Review I was hard-pressed to find anything I didn’t like; but I did come up with something. Although this quality backpacking boot is excellent on mud, steep hills and deep descents on packed dirt and vegetative off-trail slopes, it’s not the best for gripping up rocky terrain. Even with the minor negative point above, when you put everything into perspective the Salmon Conquest GTX boot still is the cream of the crop in quality backpacking boots. These boots have earned a permanent place in my gear collection. Grab a pair for yourself and wear them on your next trip. You’ll be glad you did.